We would like to extend a big thank-you to all of our members and donors! Thanks to your continued support, we paid off the initial 101 acres of the Joseph Pines preserve in January 2010! We want to thank everyone for their passion, dedication and commitment to this very important cause. We are pleased to announce that the Joseph Pines Preserve has acquired an additional 131 acres (Posey and Conservation Forestry tracts). The Sussex county pre-serve’s size is now expanded to a total of 232 acres. To accomplish this, the Meadowview Biological Research Station team successfully pursued and was granted a principal forgiveness loan (essentially a grant) of $145,000 from the Virginia Department of Environmental Quality (VDEQ). The $145,000 VDEQ award was announced in 2009. The Research Station also obtained a ten year $145,000 loan from the Virginia Resources Authority at an amazing interest rate of 0.25% inter-est. The $290,000 real estate transaction closed on June 30, 2012. As part of the expansion effort, the Joseph Pines Preserve is now placed in a permanent conservation easement with the Virginia Dept. of Forestry. It is wonderful that permanent protection of the 232 acres is ensured. 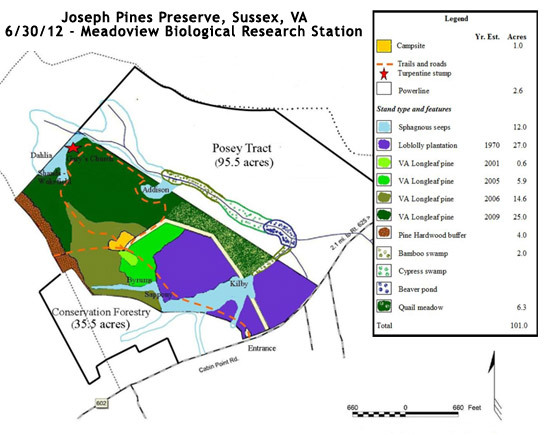 Meadowview’s Joseph Pines preserve establishes a managed area where the Virginia longleaf pine/pitcher plant ecosystem is restored and preserved. Virginia longleaf pine once covered 1.5 million acres, but popula-tions have dropped to 4432 trees remaining on less than 800 acres, based on our 1998 census. 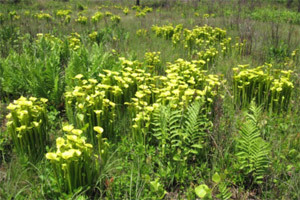 To date, the Jo-seph Pines preserve is protecting 18 known rare plant species (including the entire remaining population of native Virginia yellow pitcher plant) and habitat for 3 rare animal species. Prior to the establishment of Joseph Pines, no preserve in Virginia existed to protect this very unique community. The Joseph Pines Preserve expansion significantly expands the scope and magnitude of our restoration work and gives us nearly complete control of the watershed, preserving precious groundwater quality and quantity for seepage wetland pitcher plant bogs. The expansion also provides better control of prescribed burns and generates additional habitat for pitcher plant and longleaf pine restoration. 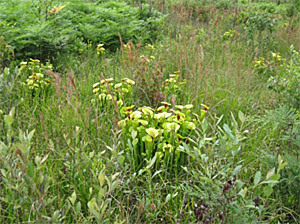 We’ve already got the best pitcher plant bogs in Virginia and the expansion puts us in a new league to showcase our preserve against premiere southeastern U.S. pitcher plant wetlands. We also anticipate the installation of several new trails and primi-tive camp sites (permission required to camp).